30 years ago after my education as management assistant in wholesale and foreign trade and after my studies in business economics, I discovered my passion for textiles. Various stations led me into my self-employment. For 15 years now I have been managing director and shareholder of Fortissimo Textiles Incorporated. A company for consulting and distribution of medical and technical textiles. 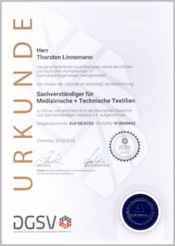 Over and over again I prepare assessments and reports for my German and foreign clients, regardless of if it is for internal quality management, outgoing or incoming goods or clearing complaints. Mostly in the medical and technical medical textile field. 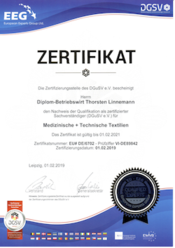 My joy for investigational work and with that the connection between professional and expert advice accumulated through my qualifications, along with a lot of positive feedback from my clients, urged me to certify as a surveyor for (DGSV e.V) for medical and technical textiles. All of which is now opening my pathway to receive my approval as a publicly appointed and sworn expert. This is reason enough for me to offer my knowledge, experiences as an independent surveyor and consultant for medical and technical textiles. I would gladly assist you in matters such as assessments or assessment statements for the development of new products or with the maintenance of already existing products in medical and technical textiles. Quickly and reliably, impartially and in a serious manner. All data is suitable for the court room. In both English and German. Da sich der Markt für Desinfektions- und Reinigungsmittel genauso wie für medizinische Kunstleder rasant entwickelt, gibt es eine wachsende Unsicherheit auf allen Seiten. Ein falscher Einsatz, eine falsche Anwendung der Mittel kann sehr hohe Reklamationskosten, Imageschäden und im schlimmsten Fall sogar gesundheitliche Schäden von Patienten und Kunden bedeuten. Nicht ohne Grund gehen die Regelungen der aktuellen Europäischen Medizinprodukte-Verordnung (MDR) sehr weit. Nur gemeinsam können Sie den gestiegenen Anforderungen Ihres komplexen Marktes und ihrer Kunden, den Ver- und Anwendern, gerecht werden, mittel- und langfristig erfolgreich sein. "Top betreut. Zeit genommen. Sachlich. Ausführlich. Schnell." "Sehr zu empfehlen, da er sich wirklich mit der Sache beschäftigt. Hinzu kommt, das er wohl sehr viel Erfahrung haben muss, da er weiß, wovon er spricht. Sehr professionell!" "Herr Linnemann hat in einem Reklamationsfall mit anschließender Vermittlung eine hervorragende Arbeit gemacht. Sein Sachverstand und seine Objektivität haben uns überzeugt. Wir können Herrn Linnemann weiterempfehlen." "Er genießt unser uneingeschränktes Vertrauen." "Ich kenne Herrn Linnemann schon viele Jahre und er hat für uns immer eine gute Lösung gefunden. Bei Materialproblemen gab es von seiner Seite immer eine klare Aussage." "Herr Linnemann hat eine Reklamation über Leder-/Kunstleder im PKW Innenraum begutachtet. Ich bin mit der Arbeit und dem vorgeschlagenen Ergebnis sehr zufrieden." In the following you will find examples and themes of what I have been doing during the last years as adviser and surveyor. Should you need further information please do not hesitate to contact me. Of course all information will be treated in confidence with you and in respect to all of my other clients. You need advice, a surveyor or an assessment statement regarding medical- and/or technical textiles? Then please contact me. I will be pleased to be there for you.